Is 1and1 a good web host? Read our complete review on 1and1 web hosting here! - Special promotion: $3.99/m for first 12 months! 1and1 started out as a marketing company in Year 1992. Over the next few years, the company had grown to become a public listed company on March 1998 with $965 million in revenues and a $3.3 billion market capitalization. 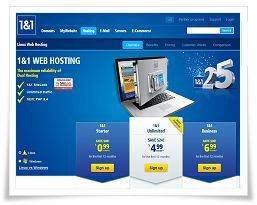 Later that year, 1and1 expanded into web hosting business in Europe. 1and1 grew rapidly and in autumn 2003 and started to serve customers directly in the US. Today, 1and1 is the world's largest and fastest growing web hosting company with over 8 million customers from all over the world and 2,500 new customers sign up every day! The '1and1 Unlimited' plan offers unlimited web space and unlimited monthly transfer volume. The '1and1 Unlimited' plan supports the basic PHP web-based application and MySQL databases. In other words, the basic Linux plan allows you to create interactive content with server-side scripting with MySQL database integration. 1and1 Control Panel - 1and1 provides a customized control panel (based on Plesk control panel) with easy-to-use interface where you can configure and control all aspects of your website - email management, domain management, hosting account and etc online. 1and1 Chat Channel - Chat is a major part of today's Internet. 1and1 provides an easy to setup and easy to use 1and1 chat feature includes person-to-person conversion or a lively chat room up to 20 people. 1and1 WebsiteBuilder - Do you want a website that looks professional and appealing without paying any web designer to design for you? 1and1 offers a quick, easy and powerful DIY solution - "WebsiteBuilder" - to help you to create professional looking website in five simple steps without having any HTML skills. 'WebsiteBuilder' comes free when you sign up any web hosting plan with 1and1. However, you are limited to create only 8 web pages using this tool! 1and1 Dynamic Content Catalog - Add dynamic feeds contents onto your website with the latest news, weather, sports, financial report, travel and dmore from reputable providers such as AccuWeather, Associated Press and the like. DynamicSiteCreator - You don't have to hire to experienced web designers to own a flash-animated website now. 1and1's DynamicSiteCreator enables you to create an impressive and professional-looking flash web site within minutes, regardless of your level of expertise. DynamicSiteCreator is a template driven web building application where you have up to 20 design templates to choose right from the 1and1 control panel. DynamicSiteCreator Flash application tool is free for you as a 1and1's web hosting customer. 24/7 Toll-Free Phone - 1and1 provides 24/7/365 toll-free expert technical support at their main line: 1-877-GO1AND1 (1-877-461-2631). 24/7mail support - In additional to the telephone support, you also have unlimited access to their 24/7 email support on various website issues. 1and1 Online FAQs - Here, you can use the comprehensive FAQ to get additional helps and tips on website configuration such as email account setup, fine tune your website and more. 1and1 operates five data centers worldwide (two owned by 1and1) with a combining of over 70,000 high-end servers. Connectivity is one of the most important aspects to consider when choosing your web host. 1and1 uses their own backbone and top carriers such as Sprint and Levels with 30 GBit of external fiber connectivity to offer a faster accessing speed to your website. In additional, 1and1 has over 250 developers and administrators monitoring the data center continuously to meet the security, reliability, speed and safety demands of your website. As such, 1and1 guarantees 99.9% server uptime.
" 1and1 has provided our company with an incredible range of tools for delivering our web presence. 1&1 has been continuously reliable in their delivery of our web content. The value 1&1 provides has far exceeded that of any other web-hosting provider we have used. " " When I signed up for 1and1's 3 year hosting promotion, I was skeptical, but to my delight, 1and1's services were so exceptional that I purchased a Microsoft Hosting account. 1and1's services are so reliable and affordable that I plan on purchasing additional services as my business expands." The '1and1 Unlimited' plan of unlimited web space and unlimited bandwidth is a an attractive Linux web hosting plan for the price of only $3.99 per month that targeting for websites with basic PHP web application with MySQL database integration. Despite being the entry-level linux hosting plan, 1and1 is still a good option if you are looking for a financially stable and well established web hosting company that will continue to provide reliable web hosting services for many years to come. While most other web hosting providers offer 30-day money back guarantee, 1and1 offers up to 90-day money back guarantee. The longer guarantee period is a strong indication that they are highly confident with their product and service quality. In short, if you are looking for a reliable and reputable web hosting provider, then '1and1 Unlimited' hosting plan is worth considering!